Man in his original state did not need to be instructed in physical exerciseâ€”neither does a child or youth with normal tastes. Man’s original state of living gave him an abundance of varied activity, out-of-doors, and with all the best conditions for exercise. He was compelled to seek his food, to prepare it, to raise his crops, to build his houses, to gather up fuel, and to do the thousand and one things which were necessary to live in simple comfort. But as man began to be civilized he also began to delegate certain of his duties to others, and to confine himself to one set of activities, until at the present day many of us do practically no physical work, while others do nothing but hard physical work of a limited scopeâ€”both living unnatural lives. Physical labor without mental activity dwarfs a man’s lifeâ€”and mental labor without some sort of physical activity also dwarfs the man’s life. Nature demands the maintaining of the balance-the adoption of the happy medium. The natural, normal life calls for the use of all of man’s powers, mental and physical, and the man who is able to so regulate his life that he gets both mental and physical exercise is apt to be the healthiest and happiest. Children obtain the necessary exercise in their plays, and the natural instinct of the child causes it to indulge in games and sports. Men, if they are wise, vary their mental labor and sedentary lives with sports and games. The success which has attended the introduction of golf and kindred games of recent years, shows that the old natural instinct of man is not dead. 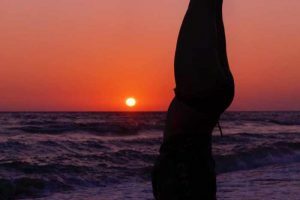 The Yogis hold that the instinct toward games-the feeling that exercise is needed, is but the same instinct that causes man to labor at congenial occupationsâ€”it is the call of nature toward activityâ€”varied activity. The normal, healthy body is a body that is equally well nourished in all of its parts, and no part is properly nourished unless it is used. A part that is unused receives less than the normal amount of nourishment, and in time becomes weakened. Nature has provided man with exercise for every muscle and part of his body, in natural work and play. By natural work, we do not mean the work attendant upon some particular form of bodily labor, for a man following one trade only exercises one set of muscles, and is apt to become “muscle-bound,” and is in as much need of exercise as the man who sits at his desk all (lay, with the exception that the man working at his trade usually has the advantage of more out-of-door life. We consider the modern plans of “Physical Culture” very poor substitutes for out-of-door work and play. They have no interest attached to them, and the mind is not called into play as it is in the case of work or games. But still anything in the way of exercise is better than nothing. But we protest against that form of Physical Culture which has for its object the enlargement of certain muscles, and the performance of the feats of the “strong men.” All this is unnatural. The perfect system of physical culture is that one which tends to produce a uniform development of the entire bodyâ€”the employment of all the musclesâ€”the nourishment of every part, and which adds as much interest as possible to the exercise, and which keeps its pupils out in the open air. The Yogis, in their everyday life, do their own work, and get much exercise in this way. They also take long walks through the woods (if they are near woods, an they usually are, for they prefer mountainous country and keep away from the plains and large cities so far as is possible), and over the hills. But they also have a number of forms of mild exercise with which they vary their hours of study and meditation. There is nothing especially novel or new about their exercise, and they bear a very close resemblance to the calisthentic [sic] exercises and Delsarte movements, in favor in the West. The principal and important point of difference, however, lies in the fact that they use the mind in connection with the bodily movements. Just as the interest in the work, and the game, brings the mind into play, so does the Yogi allow his exercise to call into operation his mind. He takes an interest in the exercises, and by an effort of the will sends an increased flow of prana to the part brought into motion. He thus obtains a multiplied benefit, and a few minutes exercise do him as much good as would ten times that amount of exercise, if performed in the usual indifferent, uninterested way. This “knack” of sending the mind to the desired part is easily acquired. All that is necessary is to accept as a fact the statement that it can be done, thus doing away with all subconscious resistance, occasioned by the doubting mental attitude; then simply command the mind to send a supply of prana to the part, and to increase the circulation there. The mind does this to a certain extent, involuntarily, the moment that the attention is centered on a part of the body, but the effect is greatly increased by the effort of the will. Now, it is not necessary to contract the brows, clench the fist, or to make a violent physical effort in order to operate the Will in this way. In fact, the simplest way to accomplish the desired result is to confidently expect that what you wish will happen. This “confident expectation” acts practically as a strong and positive command of the Will-put it into operation and the thing is accomplished. For instance, if you wish to send an increased amount of Prana to the forearm, and to increase the circulation to that part, thereby increasing the nourishment, simply double the arm, and then gradually extend it, fastening the gaze or attention upon the lower arm, and holding the thought of the desired result. Do this several times, and you will feel that the forearm has been greatly exercised, although you have used no violent motion, and have used no apparatus. Try this plan on several parts of the body, making some muscular motion in order to get the attention there, and you will soon acquire the knack, so that when you go through any ordinary simple exercise you will do this almost automatically. In short, when you exercise, realize what you are doing and what you are doing it for, and you will get the result. Put life and interest into your exercise, and avoid the listless, mechanical manner of going through the motions, so common in physical culture exercises. Put some “fun” into it, and enjoy it. In this way both mind and body obtain a benefit, and you will leave your exercise with a splendid glow and thrill such as you have not experienced for many a day. In our next chapter we give a few simple exercises, which if followed will give you all the movements necessary to exercise your entire body, bringing every part into play, strengthening every organ, and making you not only well developed, but straight and erect as an Indian, and as supple and quick of movement as an athlete. These exercises are taken in part from some of the Oriental movements, adapted for Western use, combined with a number of motions which have found favor with the physical trainers of the armies of Europe and America. These army physical directors have studied the Oriental movements, and have adopted such of them as suited their purpose, and have succeeded in forming a series of movements, which while very simple and easily performed in a few minutes, are capable of accomplishing as much f6r a man or woman as many elaborate courses and systems of physical culture which are sold at high prices. Do not let the simplicity and brevity of this system cause you to undervalue it. It is just the thing you have been looking for, with all the unnecessary features “trimmed off.” Try the exercises for a while, before you make up your mind about them. They will practically “make you over” physically, if you will take the time and trouble to put them into faithful practice.